Why? Well , my hubby told me a year ago, to start stocking up. He knew all this was coming, higher food and gas prices and job cuts. So when you see what I have, remember that I have been at it for over a year. When I go to the store, I only buy food if it’s on sale. Then I buy all I can, but I check the exp. date on everything I buy. When I’m stocking up I think to myself: how many things can I make with this, what do I really need as far as staples(how much do I use every month), will my family eat this,etc. Your ?’s to your self might be different. I am just showing you our way, but you might not eat what I do or cook the way I do. We have what I call a food barn( kids call it the grocery store). We rent, so we could not dig a cellar. So hubby made a food barn for me. It has AC in summer when it’s hot and a small heater in winter. As you can see it’s not very big, about 7ft wide by about 16ft long. 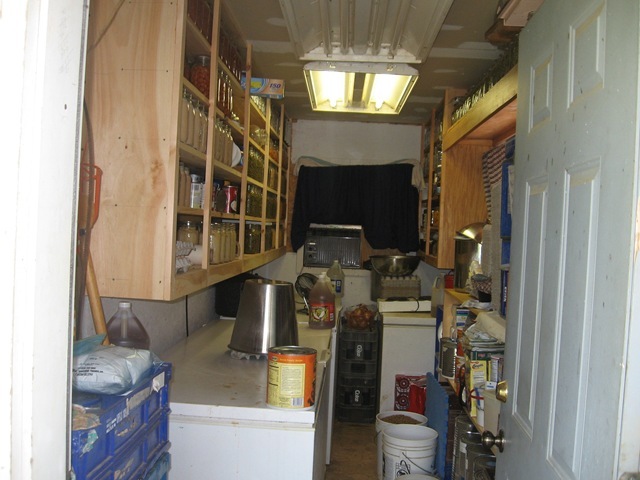 My 3 freezers are in here too, they help keep in warm in the winter. This is were I store 80% of our food. Here are some more photos of inside the food barn. 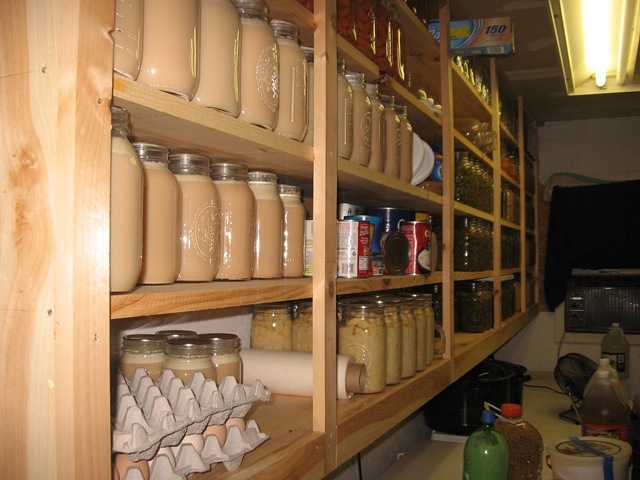 The above is canned milk from our cow, eggs from the chickens, canned potatoes,green beans,carrots. These are green beans, apple sauce(we pick up apples and pears off the ground at a friends house and cut out bad spots the size of dimes, no one else wants to pick them up and we rent so we can’t plant fruit trees, so God provides fruit this way. We usually get enough to last us until next year. ), pears. Coffee and tea are bought on sale at less than half price or a little more. I stock up and by the time they run low or out the sales back. Someone gave us their Y2K #10 cans of flour, sugar, powdered sugar, ect. The flour will not work in breads, but will do for a coating on fried foods, gravies, and noodles. Sharp cheddar cheese canned (just learned you could can hard cheeses, we don’t like it in the freezer, so watch out sales), rice in a 2 liter bottle with a few bay leaves inside to keep bugs out and top taped on, bottle of elbow noodles, canned cheese sauce( just learned to can this too), ice cream bucket with baking soda and tape closed. Rice with bay leaves inside. 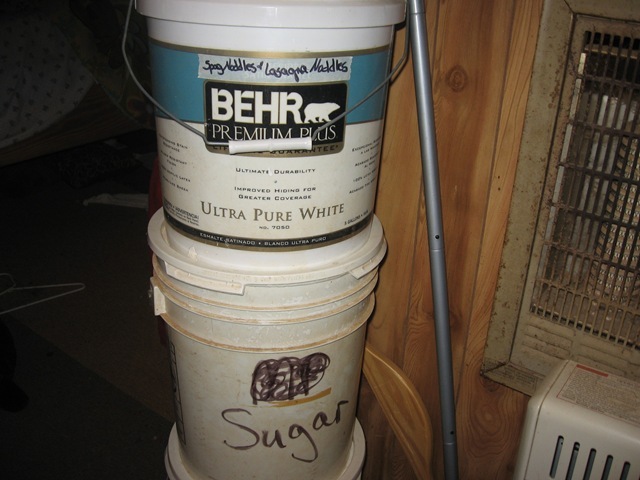 I have 4 buckets of sugar, 2 of dry milk, 2 of lard, 25 bags of flour, and more. The buckets are stored in one of our bedrooms, other things are stored under beds, in closets: anywhere I can stick things. Hope this helps someone. Start off with buying a little extra each week, or just one or two things. Nothing is going to be dropping in price any time soon. Can or put every thing you can put your hands on. But only put up what you will eat! And don’t forget to put up a few sweets up, in hard times they’ll give you a little boost, a feel good food. Cheese is our boost. wow, this is amazing. I’m really wanting to start stocking up for our family, and we are renting too….but have a full basement to put shelves and our freezer. You have give me some great ideas! Blessings! I love it! You have done a wonderful job preparing. 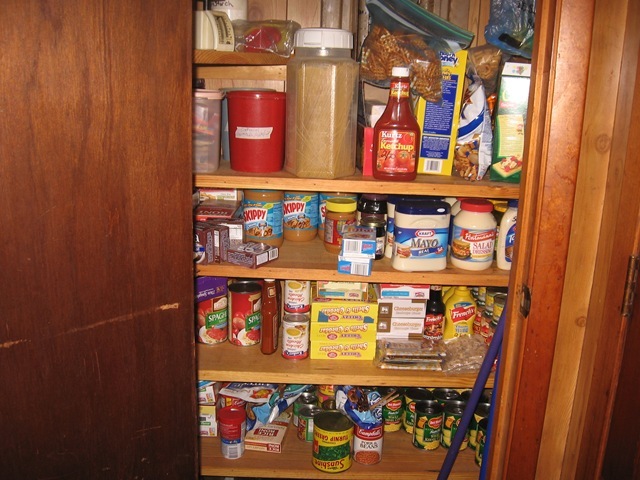 My husband has not been too gung-ho over the years about my efforts with food storage, but with all that is going on in the world at present, he is coming around. Keep up the good work. Thanks for your example. We rent our place, so we can’t plant fruit tree. You are blessed to be able too. We live in GA. May God bless you and your farm. Thanks for stopping by. Do you have the recipes for canning cheese and butter? 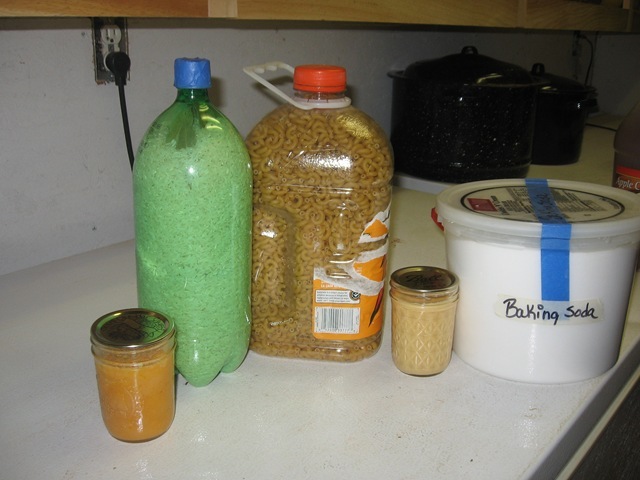 I like to can dried beans…..no need to soak. Just wash and put 1 cup into quart jar fill with water 1teas. salt and cook at 10# for 75 min. If you are doing meat and have space for a jar you can do them for 90 min and it will not hurt. I just found your site and I love it. Thank you for sharing. I too would like to know how to can cheese. Can you share? Canning cheese in under the recipe tab at the top of the pages. Canning cheese is near the end on that page. You are an amazing woman! I am praying for Tommy and your family. Thank you for sharing all of your advice. 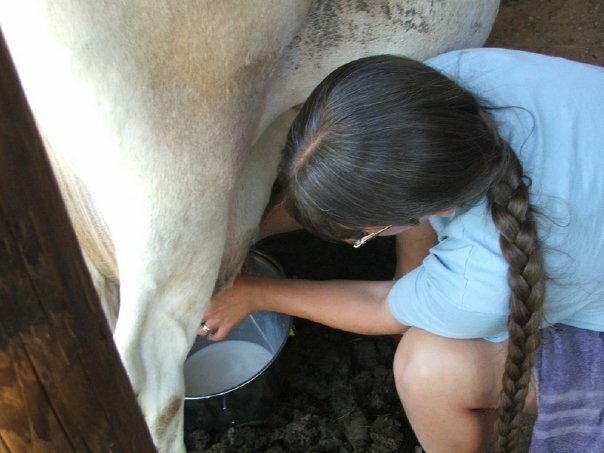 I am far from a farm girl, but my husband has a new job with half of the paycheck and we need to find ways to cut back. I have such a problem with meal worms or paper moths in the summer. I never thought of putting a bay leaf in with my rice. I don’t know where those nasty little worms come from, but they love biscuit mix, pancake mix, noodles and rice. They even chewed through the plastic lid on my oatmeal container. I may just wallpaper my shelves with bay leaves! As an old Army vet of 31 years service, I remember the old C-rations. 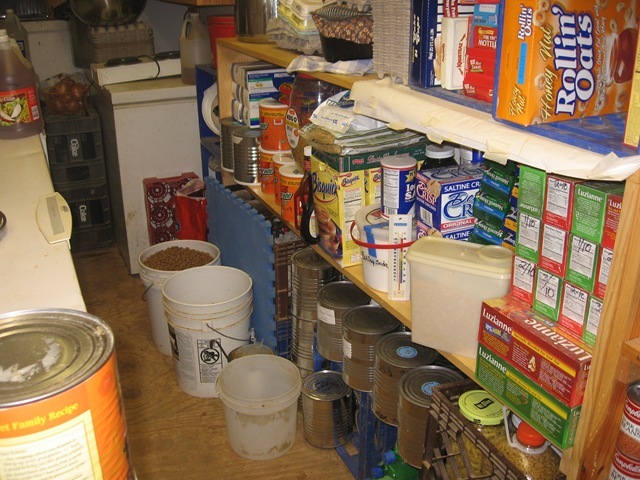 These were foods in cans – like spaghetti and meatballs (made by the Chef Boyardee company), pound cake (it was awesome), canned cookies, chicken and noodles etc. The box of C-rations camw with matches, cigarettes (4 in a pack), toilet paper (hmmm) and Chicklets. The can foods needed a can opener however and not every box had one (to save money I guess). It was called a P-38 and some old timers may still have one on their key chain. Now the Army uses MRE’s which is fine too. 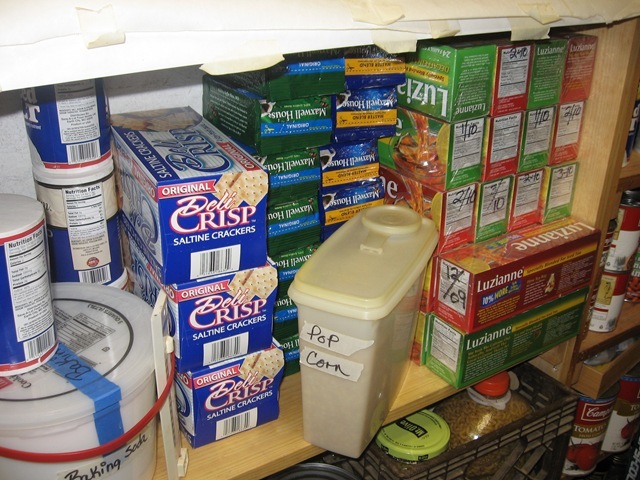 But the old ways worked so I stock up on canned foods and ones that have tabs for self-opening – no ‘P-38’ needed. I concentrate on the chunky soups that can be eaten as a meal. They are thick and have great taste. Sirloin Burger, Veggies and Chicken etc. There’s a wide variety of these. Also tuna in water, chili, Dinty Moore Beef Stew and a host of rices and other meals are available. I buy what I normally would consume – something I learned from the old Y2K preparations. Expiration dates are important so I take an indelible marker and write the expiration dates so I can easily see them. I rotate the stocks with the older things in the front and newer in the back. Water is absolutely critical no matter what else we do. We can live without food for some 50 days if necessary as I understand it (although I wouldn’t like it) but without water, we dehydrate in about 72 hours. Bottle your own, get it from the store or do both. There’s no such thing as enough water. The non-food items are things like paper towels, large green plastic bags with ties, smaller ones too, batteries in every size (every size), and sterno heaters since electric could be shut off. Get one of those little car-starters like Jump-It too. Besides starting your car it has an accessory with house current outlets on it so you can make coffee (my big priority first thing in the morning). Get medications filled as soon as you can and keep ahead of them. Ask your Doctor to increase the quantity he orders so you can ‘stock up.’ He’ll do it; if not, find one who will. Mine is great about it. Over the counter things are also important, things like a good first aid kit, peroxide, paper masks etc. There’s more to my preparations which have been ongoing for years but this will hopefully help someone. By the way, I am Catholic and have asked Our Lord if this is okay or does it offend Him since He provides for us. He always does. The answer I keep getting in my head (no voices thanks) is do your part and I will do mine. He expects us to take preparations like those in the Bible did. Noah had to stock the ark and Joseph told the Pharoah that Egypt needed to stock for 7 years of famine. I have around the house a lot of holy pictures and statues of favorite Saints. Also I keep a large supply of Rosaries, brown scapulars, blessed salt and holy water and other Sacramentals for my family and friends. Be generous with them. Have them all blessed by a Priest or Deacon. Blessed candles are a must have too. Remember, these things are not ‘lucky charms’ and have no power of their own. The power they have to protect us comes from our faith in God alone. I have Protestant friends who literally go into their closet to pray daily. That is a good thing. I am blessed to have an extra bedroom, small for guests, which I converted into a home chapel. It is awesome. Anyway, blessings to all my brothers and sisters as you prepare for whatever may be coming down the road. I think signs of a serious depression are all around us and it could get very tense in the future. I have a friend from the Army who makes fun of me for all the preparations (his wife wants to prepare and he doesn’t). I told him its like an insurance policy – you hope you never have to use it but if something happens and you have it, your going to be okay. I don’t want to find myself wishing I had done something like preparations with food and water when it is too late and there is none or I cannot get to where it is. Spiritual preparations are number one with me – getting and staying right with God through Jesus – confession, Communion and Rosaries and so on. Then comes the material preparations. Also, if you are able, don’t forget the less fortunate and share once in a while with them a few bucks, a warm pair of gloves and hat, or a bag of food from Mc Donalds. There are angels we are told in disguises right among us and that man or woman you pass by on the street – the person who you know is in bad shape – might just be one of those angels. Regardless, he or she is your brother or sister and Christ is in that person too. Don’t worry that the money you may hand them might by wine or booze or something worse….let God decided for that is who you are really giving it to anyway. At least your heart and intentions are in the right place. I forgot to mention one other thing that I think is important. I had to retire from teaching psychology due to spinal stenosis. It is difficult for me to carry heavy items and climb the stairs to the apartment too sometimes. I bring home little items at a time, mostly the perishibles like orange juice, cheese, bread, bananas and tomatoes. But I discovered that many of the local supermarkets deliver and use their services for the bulk of my grocery order. While this service is available, who knows about the future, I take advantage of it. They allow you to tell them when you want the delivery and the driver carries everything into your house for you. I put it all away when he leaves. I also tip him too – nicely – since there are many trips up and down the stairs with many heavy items like cans, bottles of water and soda etc. Just an added thought for those who are in my situation or simply cannot get out. You order right over the computer using their shopping lists and you get to see what you are ordering by picture too as well as cost. You can find the recipe for this in the recipe tab at the top of the page here. Scroll down some and you’ll see it. Put galvanized nails in you flowr, rice etc..works better than bay leaves..no bugs! Freez everything for 3 days too, then sore..also use new paint cans. I found your blog and your story has so hooked my heart. My husband, too, has prostate cancer tho it is the slower growing type. His surgery is in 3 weeks, thank God for the VA hospital. I wondered if you by chance ever heard of solar cooking using a foil lined cardboard box with a sheet of glass on top. I cook plenty of things this way on sunny days. In the even of a disaster we will cook our meals on a “Rocket Stove” (plans can be found on Youtube). 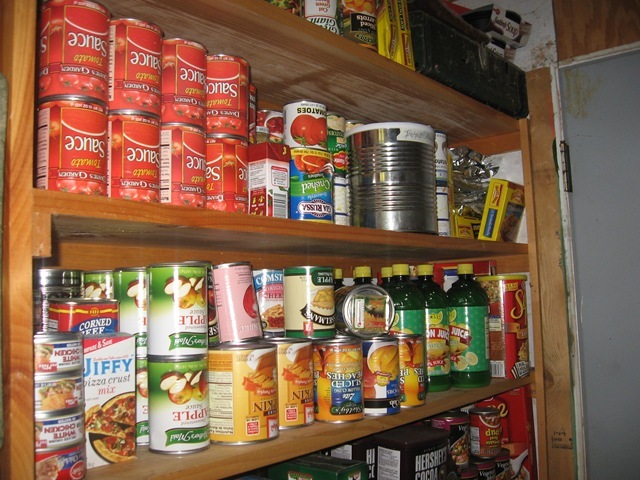 One Q is i see you store your cans upside down…is there a reason for this? Hugs to you and your wonderful family. I am sorry to hear about your husband. I have loads of research, if you have any questions, please ask. And if you ever just need an ear, I am here. You both will be in my prayers. No, I have not used a solar cooker, but have printed for two kinds made with things around the house. For just in case. And as for my stored cans being stored upsidedown, It is silly to most but works for me. I live on a dirt road, so needless to say I have a hard time with dust going every where. By turning the cans up side down I do not have to wipe the top of the can off before opening it. And some of the can to not get used as often. So more or less they are turned upside down, so I do not have to wipe/scrub the tops off. Hi, I hope you or someone sees this. I didn’t think you could safely can milk. How do you can milk or cheese? I’m fascinated. I just canned ground beef, but I’m too scared to use it! How sad is that? awesome site. I got made fun of for stocking up for y2k. Now i am trying to do it again, and getting the looks from the same people. But an ounce of prevention and all that. I booked marked your site so i can look at your lovely pantry from time to time. I rent an apartment but have an extra bedroom I do not use much so will store my stuff in there. Comment #8 by Becky– The worms are already in the grain. Tiny moths lay microscopic eggs in the grain in the field. The trick is to keep them from hatching. Freeze for 10 days when you get it, oxygen-free packaging, nitrogen packaging, etc. will keep them down. Bay leaves are only tiny help. i have been storing for two years, but when i saw where you store(containers), it gave me some ideas! thanks! A little over 2 years ago there was a gas shortage in Nashville and everyone in the area was very spooked. Shortly after that I went to Walmart for some groceries and the Lord spoke to me and said, “Look at the shelves” – it startled me though He was not audible – but deep in my spirit. I pulled my cart aside waiting to hear what He had to say to me wondering what it was He was thinking. His exact words were “If there was a world financial collapse – this would be the first place people would come – and it would all be gone in seconds.” I stood there stunned wondering what to think. So I just said, Okay Lord – what do you want me to do? and He gently said, “Just take an extra $20 here and there and put back staples – spaghetti – dried milk – honey – spaghetti sauce – tuna, etc.” He impressed upon my heart that it was not a panic thing – but a preparation thing – just like Noah and Joseph. 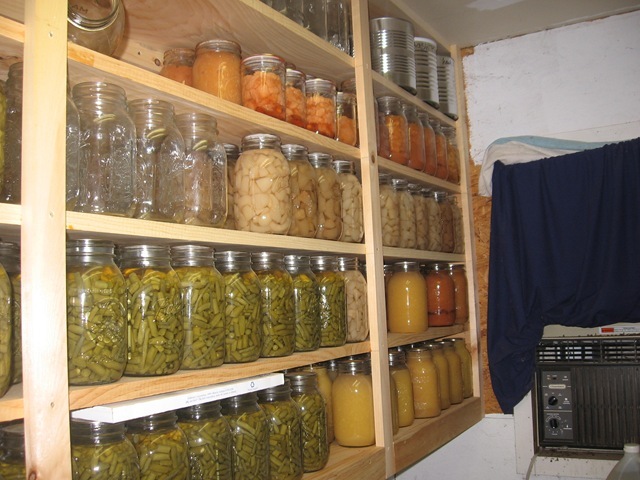 So since then I’ve taken on canning by myself (no small feat) – but as the Lord would have it – before my mother passed away she would bring me box after box of canning jars and i would say “Mom – i don’t even can – why do you keep bringing all these jars!! !” – well now i know – just another way of God providing along the way. I applaud you for your efforts and the cupboards just look beautiful that fully stocked!! God bless you and your family and all the folks who posted. 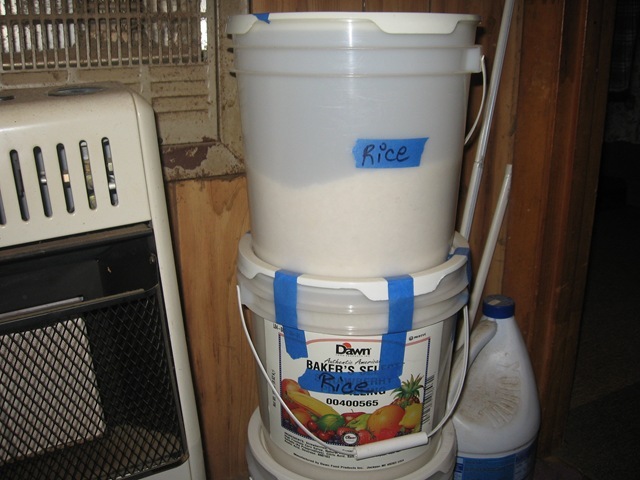 I “stumbled” on this website, looking for ideas on how to build up my food storage. I agree with so many of those who have commented. I have felt the Lord prompting me to stock up for hard times ahead. I know that God is the supplier, but we must be wise stewards of our resources and be prepared for any crisis. I have worked in the medical profession, treating cancer patients for 30 years. I am now retiring and find that being on a fixed income is very hard. I have some extra money and am planning on increasing my “stores” from 3months to 6-9months.I will be watching for and listening to all advice!! we have one but not as big as yours. 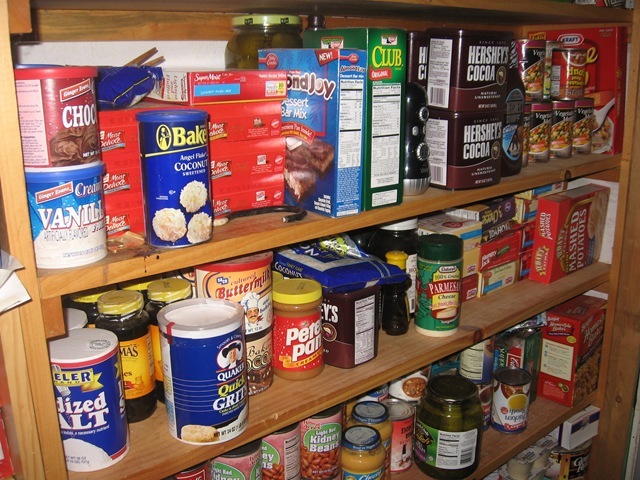 You will get more shelf life from dried foods than canned foods. All the stuff you canned, you will want to eat that first. Also, I would store grain instead of flour. Flour will go rancid whereas you keep the nutritional value with the grain in tact. I have been storing grain (and using it) since 1999. No bugs. I keep it in a cool, dry place and grind it as I need it. Overall, though, I commend you for preparing while there is plenty. Don’t forget to make a barter box. Travel-size toiletries, Folger’s singles, and hotel soaps are great things for this box. Also, I think it’s a good idea to get to know the plants around you. They will be both food and medicine. I am doing the same thing as you are and for the same reason. I have taught my self to can food this years and I am learning what nature has to offer in Arizona desert. I gathered Mesquite bean pod from a local park and have started grinding them to produce mesquite flour. When my palo verde tree sheds it’s pods, I plan to do the same. I am stocking up on cat food and all the non food items I use as well and water. I am hoping for the best but preparing for the worst.